Belgiojoso was featured in Collage Artist Trading Cards Pack 6. Collage Artist Trading Card packs are a tool for discovering contemporary, fine art collage. Each card is a full colour, 5.5” x 3.5” postcard with rounded corners. An example of an artist’s work is on the front of the card and the artist’s public contact information is on the back. We asked Belgiojoso some questions about her work. How do you go about making a collage? I use pictures from the past and present, images from contemporary Italian magazines or international pictures from any sources. I choose a main character that inspires me and I start from there. Through “free associations”, shapes and colours, I start building up a new image, a new story. I use tiny pieces of paper that I glue together with supports of different thickness so that the final result is a “paper sculpture”, a three-dimensional collage where the shadows give a feeling of deepness. 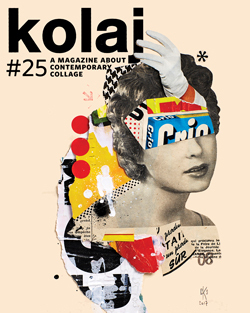 Why do you work in the medium of collage? 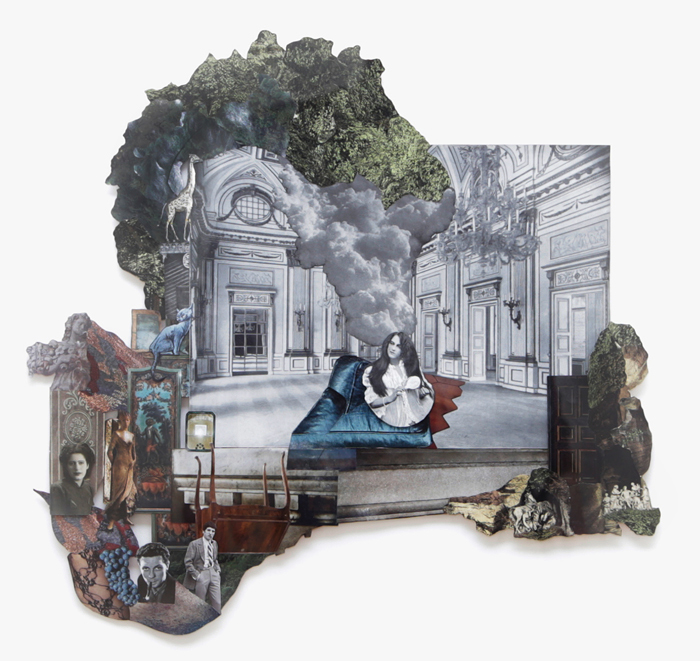 I’m an Italian psychotherapist, working with the medium of collage for three years now. I choose this medium because I love vintage imagery and antique photographs. I love to search for forgotten images and to reuse them in new stories that are as valid today as in the past. I’m interested in states of mind, thoughts and inner worlds that I try to represent mixing pictures in a playful but yet very serious way. We included When He Loved Me in Buenos Aires in Collage Artist Trading Cards Pack 6. What can you tell us about this collage? 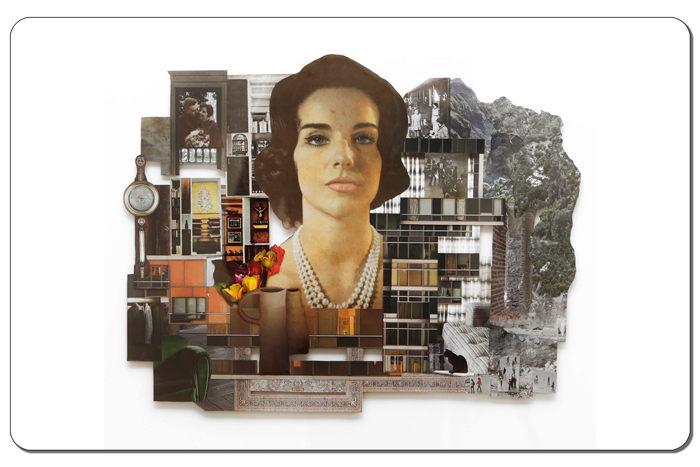 This collage is part of a series called “Interiors” that depicted women represented in their houses as if those were their inner worlds. The house is a metaphor for their interior thoughts and state of mind. They are all suspended in time and in action, stopped in front of an imaginary mirror. What is going on with the woman in the collage? She is lost in her thoughts, alone at home (represented in the lower left side of the collage) watching out from her window (lower right people walking in the streets). She is retrieving a memory of the past (upper left vintage photograph) when she had a love story with a man that loved her. But the love story–we don’t know why–it’s over and she feels that sense of emptiness and loss represented also by the train station scene (upper right). Buenos Aires in the title refers to the fact that I cut her image from the cover of a vintage women’s magazine that I bought in Buenos Aires. She was the “ideal female image” of the 1960s in Argentina. I am now working on a new series of collage using old art posters. It’s totally different, as this time the pieces of paper are not tiny like the ones I used to cut out from the magazines, but are much bigger. I’m using posters of iconic artworks that I bought when, as a student, I went to major exhibitions. They hung in my bedroom for years and were ready to be cut. 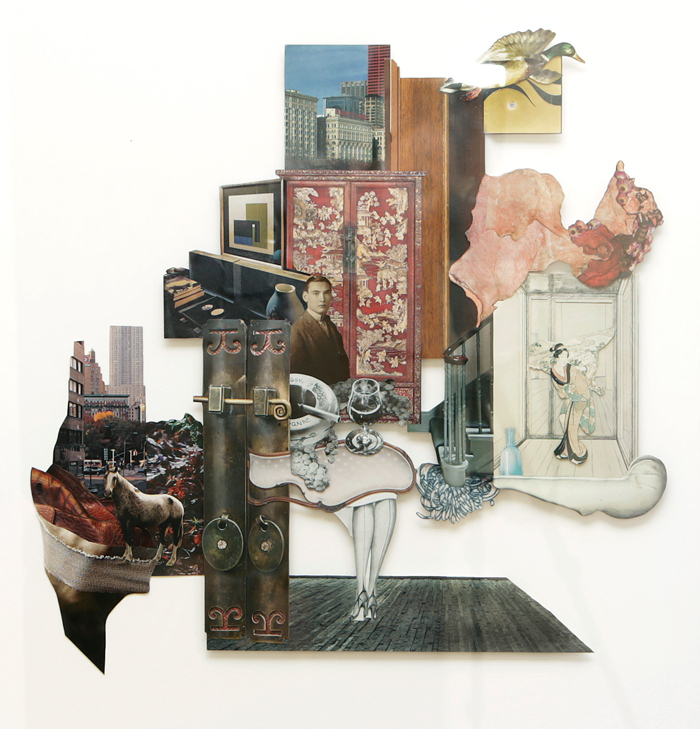 These new collages want to be a metaphor for the art learning/making process. Before we learn from the great masters, we watch them. We internalize them and we make them ours by cutting them and re-arranging them in new artworks with a new personal meaning. 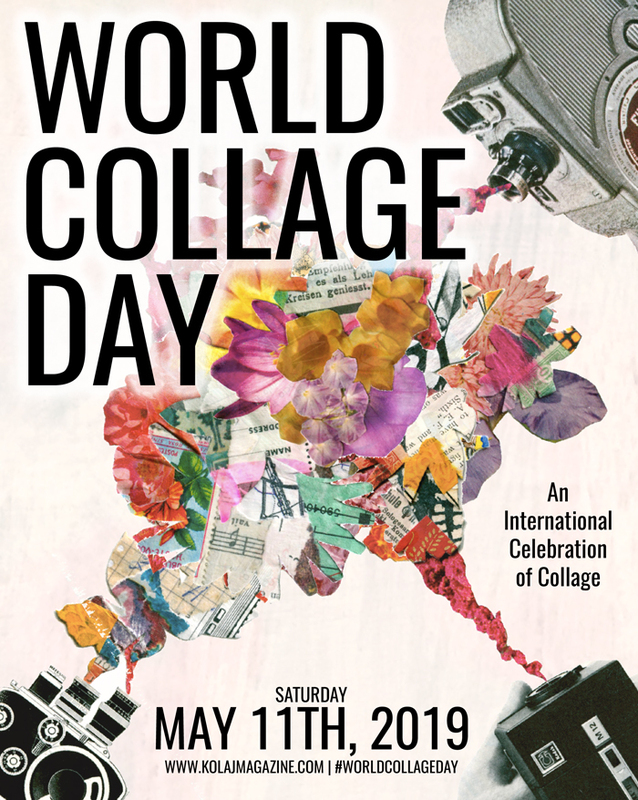 Viewing these collages, the viewer will have the sense of something that they already know, a familiarity with details cut out from Leonardo, Matisse, Hayez, and Caravaggio’s paintings even though they are not really recognizable. Francesca Belgiojoso lives and works in Milan, Italy. More of her work can be seen on her website, on her Facebook page, or on Instagram at where she posts pictures of her work in progress daily.